The Historic 1908 Courthouse serves as the Art & Cultural Center of Grayson County, Virginia. The building served as the county courthouse for Grayson County from 1908 when it was built until 1979 when the county government moved into the new courthouse. Located at the junction of highways US-21 and US-58 in far southwest Virginia, the 1908 Courthouse is in the center of Independence, the county seat. It is the second courthouse to be built on this spot and the third courthouse overall in the history of the county. Since the Grayson County government moved into their new quarters in the late 1970’s the 1908 Courthouse has been restored and now houses the Crossroads Museum, the Baldwin Auditorium, and the Treasury Gift Shop, as well as offices housing businesses and other non-profit organizations. The courthouse is a truly a spectacle to behold. The exhibits inside are lovely but I am more partial to the architecture of the building. That’s a biased opinion though; I’ve been told that my Great Great Grandfather helped build it. After briefly walking the grounds, viewing the exhibits (which includes one of Eleanor Roosevelt’s dresses), and talking to the staff, my Granddad and I journeyed out into the hollers in search of family graves. 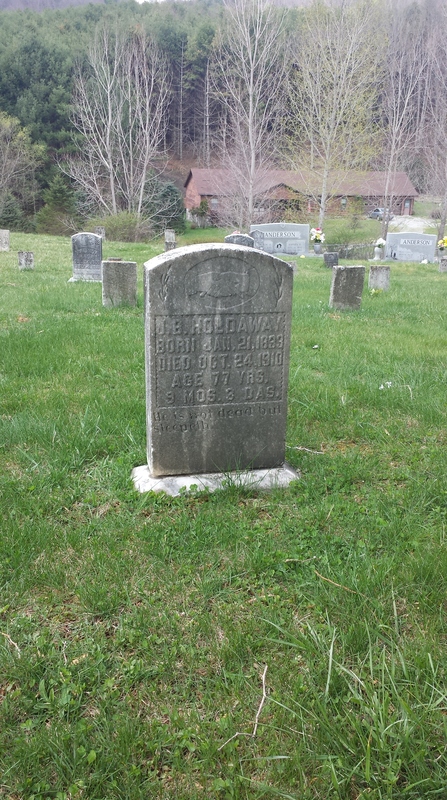 Part of the Holdaway family plot at Grubb’s Chapel Cemetery. Many of the Holdaways that I am directly related to, were laid to rest in Grubb’s Chapel Cemetery. You can see the graves in the picture above. The cemetery is only a couple of hundred yards from where my ancestors settled. The house of my Great Great Grandfather still stands and is currently occupied by Gary Holdaway. I think the cemetery itself is fairly nice for a final resting place. It is still in use today, and the landscape is serene. Unfortunately for us, not many of the Holdaways have readable tombstones. A couple don’t even have headstones anymore, just foot-stones. The two that do have a complete identifiable set are Jackson B. Holdaway and his wife, Nancy. Grave of my Great Great Great Grandfather, Jackson B. Holdaway. Served with the 51st VA Inf., Co. K (CSA) during the Civil War. As the caption illustrates above, Jackson Holdaway is a Confederate ancestor of mine on my father’s side of the family. I’m still wading through his war record in order to understand his service. We noticed when we got to the grave that he and his wife have newer tombstones. I had heard his original tombstone was there, but broken. I found that headstone lying next to his foot-stone. The initials, “J. B. H.” were carved into it. I have no idea who replaced the original tombstone with the updated version, but the new stones can’t be over fifty years old. The new headstone certainly is not typical of the SCV or UDC so I don’t think Confederate Veterans groups had anything to do with the replacement. Another unsolved mystery I guess. After spending some time at the cemetery, we visited my distant cousin Gary at the old Holdaway house. Gary has put some serious elbow grease into the place. It has modern amenities without abandoning some of the old technology or structural integrity. When we visited, he had several projects going, including installing kitchen cabinets made out of old chestnut planks. It’s simply amazing to stand in a house that is over one hundred years old. If those walls could talk. The day concluded with my Granddad and I eating dinner with several generations of the family. That next day, we took the long journey back to Ringgold. It was a great experience overall and I enjoyed spending some time with a branch of the family I never see. I hope to get back up to Grayson County soon. What is the mystery of Carl Holdaway? It is detailed in the May 3, 1911, page 5, issue of the Times Dispatch (Richmond, Va). He was shot robbing Jack Phillip’s store in Fox Creek, Grayson, Va. Said he read dime novels & transpired to be a robber. Let me get with my grandfather – we are in contact with several Holdaways that still live in Grayson Co. Virginia – they’ve got an interesting perspective on the story (granted – family lore vs newspaper accounts) – If I’m not mistaken though, Carl was hardly a “youth” when this event took place. Thank you for the newspaper though, that’s definitely a first. Glad I could be of help in solving this family mystery.